We always have a good time during these Interior Design education-sessions, even though the classes are jam packed with information and the content moves along very quickly. I thought it was high time I share a post about the instruction I do for Temple University. I’ve been teaching Interior Design classes for the Non-Credit department of this well known University Since 2004…although it surely doesn’t feel like it’s been that long! I thoroughly enjoy the educational process and the wonderful variety of people I’m privileged to meet and mentor along the way. The campus of Temple University in Fort Washington is located in an office park at the corner of Commerce and Virginia Drive in Fort Washington at 401 Commerce Drive. This location is convenient and newly renovated. The classrooms are clean, and comfortable, and are easily accessed from the adjacent parking lot. The Interior Design Certificate program at Temple University entails 30 hours of course work throughout 5 classes, which most participants complete in a single quarter. I like to tell interested potential students that it’s the ‘Cliff Notes’ of interior design. I’ve developed a series of PowerPoint Presentations, which I present along with hands-on activities and my own brand of humor. We always have a good time during these Interior Design education-sessions, even though the classes are jam packed with information and the content moves along very quickly. During ‘The Effective Use of Color’ students actually try their hand at mixing colors. This aids in training the eye to analyze colors and with identifying undertones. The classes generally take place in 2-hour sessions, held once per week in suburban Philadelphia’s Fort Washington or Ambler locations of Temple University. In the summertime, we also offer a week-long ‘intensive’ version, in which the same educational content is delivered during a 6 day span (Monday through Saturday). There are also several non-credit ‘elective’ classes at Temple University in subjects relating to Interior Design. I’m just getting ready to teach a class called “Interior Design for Real People” for the first time in a couple of weeks. It will involve a single two-hour class in which I’ll be sharing real-life before and after photos of actual projects I’ve worked on. I’ll discuss the process I underwent with my clients to achieve beautiful results. Another popular elective class is “The Business Side of Interior Design”, which helps individuals who are interested in starting their own Interior Decorating consulting business. I love helping people realize their dreams of working in the design industry…it’s very rewarding to see the successes many of my students have achieved! My pupils come from a variety of backgrounds: some are seeking to enter the interior design industry and some are just homeowners seeking to improve their environment or decorating their shore house. Regularly I get Real Estate agents, looking for education about assisting homeowners with the homes they are selling, and often I get people who are flipping properties for investment purposes. Everyone is welcome and even those who already have some knowledge of the industry will find the classes helpful. 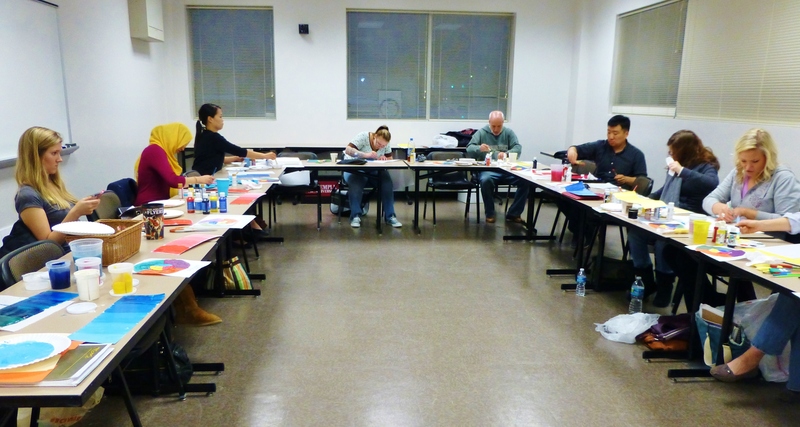 You can always find out more about the Interior Design Certificate Program at Temple University, by visiting the non-credit website here: http://ambler.temple.edu/academics/non-credit-programs and clicking on the Interior Design Certificate Program. There are lots of other great classes you might be interested in too! Thanks for visiting Kristine Robinson’s Blog. I hope to see you in one of my classes soon! Until then, please tell everyone you know about my blog–I need all the friends I can get!! This entry was posted in Color, Education, Home Decor, Interior Design, Temple University and tagged accessories, Classes, College, Color Schemes, Decorating, Fabric, Furniture, Interior Decorating, Interior Design School, Non-Credit, Paint. Bookmark the permalink.